What better way to enjoy the last days of summer than with several friends and a few of these lageritas? Its name might be playful, but trust me, its potency is no joke. It’s simply your favorite Mexican beer in margarita form. Since Mexican beers are considered an import here in Berlin, I figured this was no occasion for lime and lemon juice from little squeezable bottles, so I insisted on using fresh and would urge you do to the same. Juice the ginger by using the smallest grating edge of a box grater over a large plate. Allow the juices and pulp to collect in the plate until you’ve grated most of the knob. Collect all the pulp from the bowl and along the underside of the grater, and squeeze the juice into a large measuring cup (a 2-cup measure or larger is just fine). You should end up with about 3-4 tablespoons of ginger juice, depending on how juicy your piece of ginger is. Next, add the lime juice, lemon juice, triple sec and tequila to the measuring cup. Stir to combine the ingredients. If you prefer your lagerita served in a glass with salt, rub the rims of chilled glasses with a cut of lime and dip the edge of the glasses into a plate of sea salt. 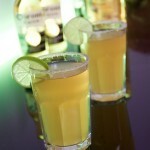 Pour the beers into chilled glasses and divide the ginger-tequila mixture evenly between them. 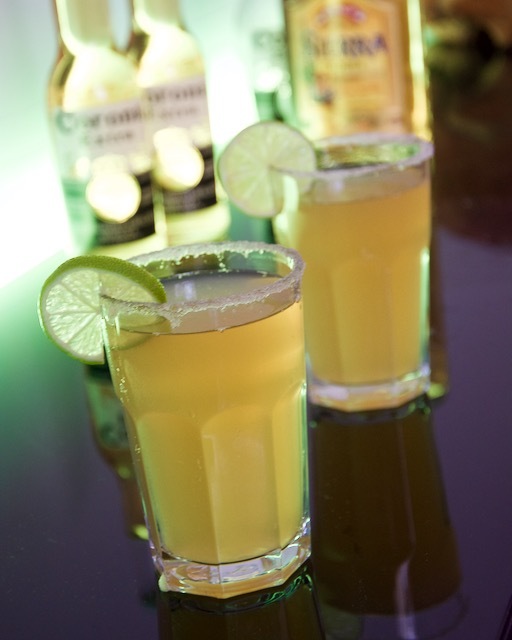 Garnish the glass with a wedge of lime and enjoy!